"Is he normal?" 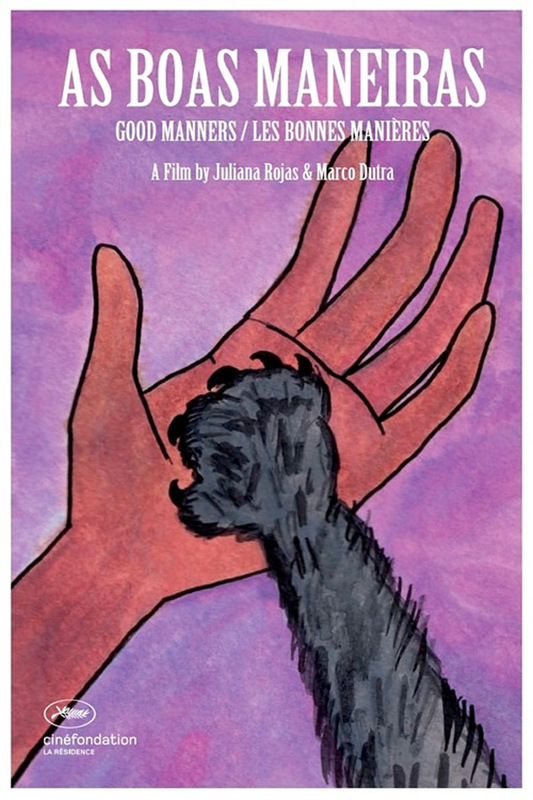 A trailer has arrived online for a Brazilian fantasy horror film titled Good Manners, which just premiered at the Locarno Film Festival in Switzerland and is also playing at the Sitges Film Festival coming up. The story is about a lonely nurse hired by a wealthy, mysterious woman named Ana to be the the nanny for her unborn child. But she soon realizes things are a bit strange when she discovers Ana sleepwalks around the house at night looking for prey. Isabél Zuaa stars, with a cast including Marjorie Estiano, Miguel Lobo, Cida Moreira, Andréa Marquee, and Felipe Kenji. This looks very peculiar and eerie, but it's that final shot with the freaky dog (boy?) that really sells this. I dig the hand drawn poster art, too. Clara (Isabél Zuaa), a lonely nurse from the outskirts of São Paulo, is hired by mysterious and wealthy Ana as the nanny for her unborn child. The two women develop a strong bond, but a fateful night changes their plans. Good Manners is both written and directed by Brazilian filmmakers Marco Dutra (The Silence of the Sky, When I Was Alive, Hard Labor, The Shadows) & Juliana Rojas (Necropolis Symphony, Hard Labor, The Shadows). This just premiered at the Locarno Film Festival and is also playing at the Sitges Film Festival this fall. No other release dates are set yet, as it is still seeking distributors. Stay tuned. Interested?